For your little one who loves ALL things whimsical and fun! A fresh and funky tea set! 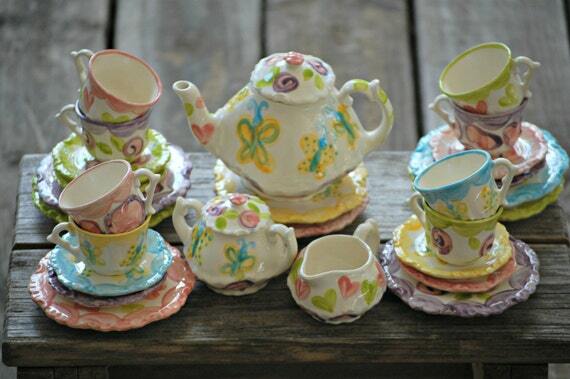 Teapot & tea cups are decorated with whimsical flowers, hearts, animal print, butterflies, dots and more! Each cup and saucer are a different, to make it more fun and whimsical. They're personalized with a name or initial on the tea pot and tea cups. Set includes your choice of 4 (FOUR) teacups with matching saucers, and the teapot with lid, creamer, and sugar bowl with lid. All handpainted in your choice of colors & personalization. Additional tea cups and matching food plates can be purchased at a discounted price -- they make lovely party favors! Handpainted using food-safe, dishwasher safe paints and glazes and fired in my kiln, and proudly handmade in the USA from start to finish. Teapot measures approximately 7 inches high, 10 inches wide, just right size for little girls. AT CHECK OUT, IN THE 'NOTES TO SELLER SECTION', PLEASE TELL ME THE NAME FOR PERSONALIZATION, DATE NEEDED AND ANY OTHER SPECIAL REQUESTS (COLORS/DESIGN IDEAS, ETC). Please allow up to 4 weeks for shipment - as with all my items since they are custom painted just for you!